If you haven’t been over to Dollar lately, you haven’t seen the transformation that has taken place this season. The mountain has always been a great place to learn to ski and board or to challenge yourself at an exciting terrain park, but this year, the Resort has enhanced many of the features and programs on Dollar to make it a fabulous place for everyone, from tiny tots to shred-ready pros, to play all winter long. Much is also new and different this year on Dollar’s storied slopes. One major change is in the introduction of newly-designed flow-style terrain parks and progressive features, “parks for everyone.” Sun Valley partnered up with industry-leader Snow Park Technologies to create the future of terrain park enjoyment. A major component of this is the expansion of terrain that teaches. Prospector Park, the popular teaching venue beside Quarter Dollar, has continued to evolve and grow. It now features a long spine that is lots of fun as well as being a really great teaching tool. According to Sun Valley’s amazing SnowSports pros, the spine is the perfect spot to work on parallel turns. A new terrain environment, the Mineshaft transition park has also been created on the other side of Quarter Dollar. “Mineshaft is a very interesting park, a larger version of Prospector,” Tony explained. “It has bigger spines and a bigger banked turn cross course with a lot of really cool features. Then below the old race shack is a long 6’ halfpipe with rollers next to it. They way the park is set up is meant to encourage people to try it and to be in it together. It’s one big playground. It’s not intimidating and is made up of carving bowls and soft features instead of walls. This park won’t launch you into the air! It’s really important to realize you can get into the sculpted terrain and have a great time.” Another fun feature of the Mineshaft is one of the entrances is a ‘mining shack’ users can ski or ride through on their way to the other features. The addition of a 350-foot magic carpet, the “Silver Dollar” lets users cycle through the park without always having to access the lift. Dollar is also just a great place to spend the day. Carol’s Dollar Mountain Lodge is spacious, bright, and inviting, and serves some pretty delicious fare. Sit out on the terrace on a nice day, turn your face to the sun, and get a front row view of the park action. 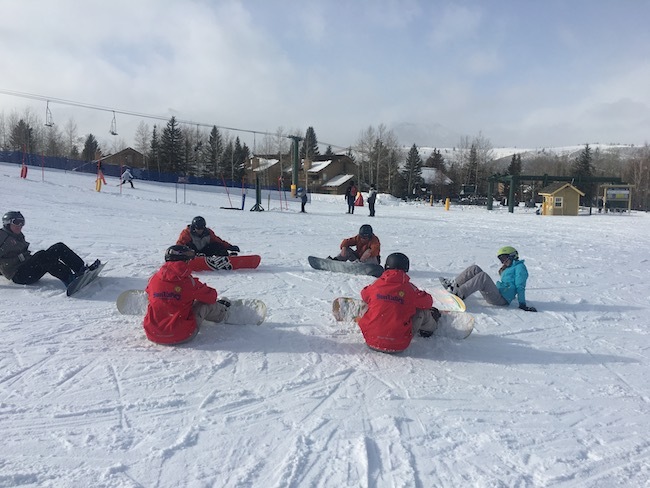 Whether you are an absolute beginner, a seasoned pro, someone who has always been wary of terrain parks, or someone who can get enough of them, Dollar is for you! 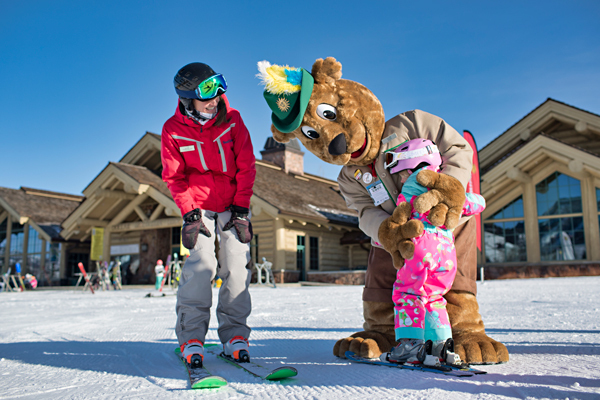 Go say hello to Sunny the Bear and get out there on the beautifully maintained, expertly conceived, and varied runs and parks. They will keep you coming back all season long!